We are stuck, stymied, frustrated. But it needn’t be this way. There is a formula for success that’s been followed by the icons of historyfrom John D. Rockefeller to Amelia Earhart to Ulysses S. Grant to Steve Jobsa formula that let them turn obstacles into opportunities. Faced with impossible situations, they found the astounding triumphs we all seek. 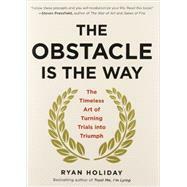 This book reveals that formula for the first timeand shows us how we can turn our own adversity into advantage. RYAN HOLIDAY is the bestselling author of Trust Me, I'm Lying, about the new era of media and culture, and the e-book Growth Hacker Marketing. His writing has appeared in the New York Observer, Forbes, and Fast Company, among other outlets. He lives in Austin,Texas.